Spaghetti and meatballs is a meal that gets everyone around the table in a hurry. In a large sauce pot, add the olive oil, onion and garlic and sauté over medium-low heat until translucent. You don't want to burn the garlic or brown the onions. Add the red wine and cook for 2-3 minutes. Stir in the tomato paste, chopped tomatoes and passata/puree and mix well. Add sugar, dried basil, Tabasco sauce and salt and stir to combine. Simmer on low heat for 1½ hours then add the meatballs and continue to simmer for another hour. This is more sauce than you'll need but I make this much and freeze what I don't use. Wet hands and shape meatballs about the size of a golf ball and place on a baking sheet that's been covered with tin foil and sprayed with cooking oil. In a large pot of boiling salted water, add the dried spaghetti and cook for 13 minutes until al dente. Drain. 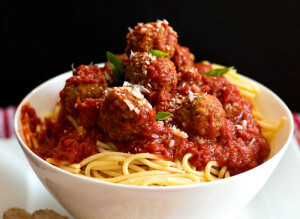 Serve spaghetti with sauce and top with meatballs and shaved Parmesan cheese on top.